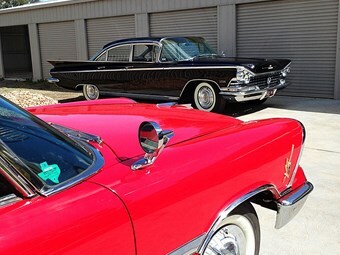 Just two of the star cars in our 1959 fin-fest. Unique Cars magazine is in the throes of putting together our biggest-ever fin-fest. We’re heading back in our time machine to 1959, when the emergence of the space race and the rapid development of the jet aircraft inspired some of the most outlandish cars ever made. Massive rocket-like tailfins were the go, with designers seemingly given a free hand to do whatever they felt like. Today, such excess in metal seems unthinkable. The cars themselves were massive, perfect for cruising the freeways and, perhaps more importantly, impressing the neighbours. It’s unlikely we’ll ever see their like again, but you can still get your own example for affordable money. Look for the special feature in issue 395, our November 24 edition.